Cross Site Scripting or XSS vulnerabilities have been reported and exploited since 1990s. XSS got listed as the top 2nd Vulnerability in the OWASP 2010 Web application Vulnerabilities list. Cross-site scripting (XSS) is a type of security vulnerability typically found in web applications which allows the attackers to inject client-side script into web pages viewed by other users. The execution of the injected code takes place at client side. A cross site scripting vulnerability can be used by the attacker to bypass the Same Origin Policy (SOP). In the past, the potentials of XSS vulnerability were not known. XSS was mainly used for stealing cookies and for temporary or permanent defacements and was not considered as high risk vulnerability. But later XSS tunneling and Payload delivering showed us the potential of XSS Vulnerability. Most of the large websites like Google, Facebook, Twitter, Microsoft, and Amazon etc. even now suffers from XSS bugs. That’s a brief introduction about XSS. XSS Tunneling: With XSS Tunnel a hacker will obtain the traffic between the victim and a webserver. Client side code injection: A hacker can inject malicious codes and execute them at client side. DOS: A hacker can perform DOS against a remote server or against the client itself. Cookie Stealing: A hacker can obtain the session cookies or tokens of a victim. Malware Spreading: A hacker can spread malwares with a website which is vulnerable to XSS. Phishing: A hacker can embed or redirect to a fake page of the website to get the login credentials of the victim. Defacing: Temporary or permanent defacement of web application is possible. Many tools are available for detecting XSS vulnerabilities in web applications. But most of these are not so easier to use or you should specify XSS payloads manually. I found many Penetration testers just using <script>alert(‘XSS’)</script> or <script>alert(document.cookie)</script> as the POC for the detected XSS vulnerability which often fails to create an impression on their clients that XSS is a severe threat. So I thought of the possibility of a new user friendly tool with a payload list to test against XSS in a web application and an XSS Exploitation Framework. After a 5 months research, I built a XSS payload database of over 500+ XSS payloads and implemented a tool in VB.NET and that is Xenotix XSS Exploit Framework. 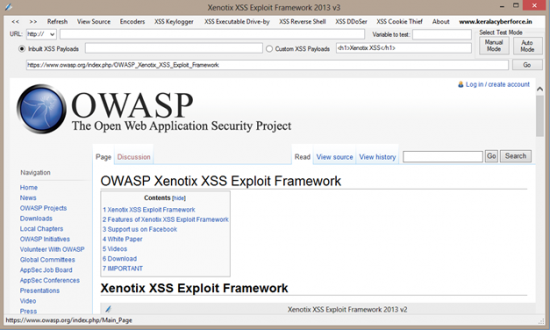 What is Xenotix XSS Exploit Framework? Xenotix XSS Exploit Framework is a penetration testing tool to detect and exploit XSS vulnerabilities in Web Applications. This tool can inject codes into a webpage which are vulnerable to XSS. It is basically a payload list based XSS Scanner and XSS Exploitation kit. It provides a penetration tester the ability to test all the XSS payloads available in the payload list against a web application to test for XSS vulnerabilities. The tool supports both manual mode and automated time sharing based test modes. The exploitation framework in the tool includes a XSS encoder, a victim side XSS keystroke logger, an Executable Drive-by downloader and a XSS Reverse Shell. These exploitation tools will help the penetration tester to create proof of concept attacks on vulnerable web applications during the creation of a penetration test report. It is having an inbuilt XSS payload list of above 500+ XSS payloads. It includes HTML5 compactable XSS injection payloads. Most of the XSS filters are implemented using String Replace filter, htmlentities filter and htmlspecialcharacters filter. Most of these weakly designed filters can be bypassed by specific XSS payloads present in the inbuilt payload list. 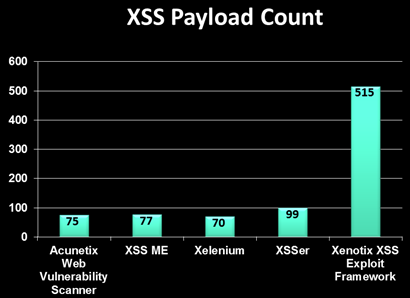 The above chart shows the number of XSS Payloads in different XSS Scanning tools available in market. Xenotix XSS Exploit Framework got the world’s second largest XSS Payload list after IBM AppScan Security which is having 700 million payloads. The tool is having an automatic test mode based on a time interval. You have to specify the time interval according to the time taken by a webpage to load which depends on your bandwidth. It will test all the payloads one by one after the specified time interval. With this feature automated XSS testing can be done. You don’t have to check all the 500+ payloads manually. Java Drive-by download can be implemented with Xenotix XSS Exploit Framework. It allows the attacker to download and run a malicious executable file on the victim’s system without his knowledge and permission. You have to specify the URL for the malicious executable and then embed the drive-by implemented webpage into a XSS vulnerable page and serve your victim. When the victim view the injected page, the java applet client.jar will access the command prompt and with the help of echo command, write down some scripts to a Visual basic script file named winconfig.vbs in the temp directory(%temp%) and then the cmd.exe will start winconfig.vbs. The winconfig.vbs will download the malicious executable specified by you in the URL to temp directory and rename it as update.exe and finally it will execute update.exe. The downloading and executing of the malicious executable happened without the knowledge and permission of the victim. The inbuilt Encoder will allow encoding into different forms to bypass various filters and Web Application Firewalls. The encoder supports Base64 Encoding, URL Encoding, HEX Encoding, HTML Characters Conversion, Character Code Conversion and IP to Dword, Hex and Octal conversions. A XSS Reverse Shell can be implemented with Xenotix XSS Exploit Framework. This is made possible with the help of Java Drive-By. The XSS vulnerable web application exploited with the injectable scripts generated by XSS Reverse Shell when presented to a victim will initiate the drive by download of a Reverse TCP connecting shell. After the drive-by download, the reverse shell is executed by the same method used in Java Drive-by. 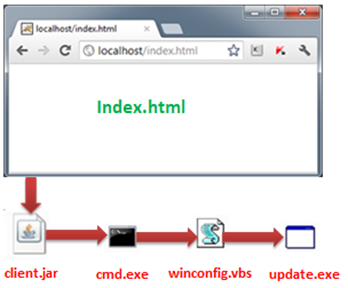 Figure 6 – Establishing a reverse shell by exploiting XSS in web applications. The advantage of this method is that the reverse shell is downloaded and executed in the victim’s system without his knowledge. But for the execution of reverse shell, it will pop up a UAC dialog requesting for the permission to run the executable. The tool is having an inbuilt Listener that listens to the reverse shell. It is designed in a user friendly manner. All you have to do is to specify the reverse connection IP and port. It’s the traditional Cookie Stealer but a bit advanced and with real time cookie viewer. This module allows the pentester to create cookie stealing POC. Suppose you suspect that the variable ‘term’ is vulnerable to XSS. For testing against XSS in Xenotix XSS Exploit Framework you should specify the protocol, which is http or https. Then give the website URL other than the suspected variable in the field after the protocol and specify the suspected variable in the Variable to test field. Now select between Inbuilt XSS Payloads or Custom XSS payloads. You can select between Manual Mode and Auto Mode to start testing. Current version of XSS Exploit Framework is based on Internet Explorer’s webpage rendering engine Trident. Since XSS got slightly different behavior in different Web Browsers, the support for the Gecko (Used by Mozilla Firefox) and Webkit (used by Chrome, Opera, and Safari) Rendering engines will be added up in the next build. The support for XSS in POST Parameter and XSS testing by modifying the headers will be included in the next build. XSS Proxy to tunnel the victim-server traffic will be added in future builds. Automatic detection of parameters or variables vulnerable against XSS and DOM Based XSS detection will be added up in next build. XSS in popular website is a high security threat. Xenotix XSS Exploit Framework can be used by Security Analysts to perform penetration test on Web Applications against XSS vulnerability and to create POC with the inbuilt exploitation framework. Most of the security tools related to XSS are either XSS Scanners or XSS Exploitation tools. Xenotix XSS Exploitation Framework is the first of its kind to act both as an XSS vulnerability scanner as well as XSS exploitation framework. Bug bounty programs like Google Vulnerability Reward Program, Facebook Bounty, Paypal bug bounty etc. are there. So go for XSS hunting and grab your bounty. Our Favorite XSS Filters/IDS and how to Attack Them – Eduardo Vela and David Lindsay. Blackbox Reversing of XSS Filters – Alexander Sotirov. Ajin Abraham is an Information Security Researcher currently doing his B-Tech in Computer Science. He is the creator of Xenotix XSS Exploit Framework. He had published different whitepapers and tools in the scope of Information Security. His area of interest includes web application penetration testing, coding tools, exploit development and fuzzing.